Hans Moleman: Please kill me. Marge Simpson: That poor man, I hope someone does kill him. Something horrible has happened or is happening to Alice. Her pain is unbearable. Even her loved ones look away and cover their ears, trying to block out the sights and sounds of her agony. There is nothing they can do to ease her pain or save her. But they can offer one last mercy to their friend: they can end it all for her now, before it gets any worse. Whatever is afflicting Alice is usually in the category of a Fate Worse than Death (thus making the death a kindness). There may be a Body Horror that nobody can figure out how to destroy. Or Cold-Blooded Torture has left her horribly maimed and screaming incoherently. Maybe she's being Eaten Alive. Or perhaps she's about to succumb to The Virus or The Corruption, and she wants to Die As Herself. It may be that she could survive, but they have no access to medical care; or that Alice, if she lived, would be reduced to a shell of her former self. Whatever the reason, this trope implies that death is the merciful option, even if Alice is begging for her life (or is so overcome that she cannot speak at all). Instant Death Bullet is likely, and justified in this situation: the killer has no difficulty getting to a position and attacking in a manner that would cause quick death. There is usually a moment when a glimmer of self-awareness allows Alice to show her gratitude through a tearful smile or the like. This is usually easier when the shooter is Cradling Their Kill. The Medic, even if holding to Thou Shalt Not Kill, may make an exception for these. Note that in Real Life, euthanasia is extremely controversial. In either case, it is usually an incredible Tear Jerker. Not to be confused with Put Them All Out of My Misery. Very common in zombie stories, for obvious reasons. Contrast Cruel Mercy, which aims to do the exact opposite. Compare the combat-ending Coup de Grâce, the villainous Thwarted Coup de Grâce, and the assisted-suicide I Cannot Self-Terminate. See also Staking the Loved One, where this is usually the motive. A subtrope of Shoot the Dog, whose trope namer was a Mercy Kill. A Mercy Kill Arrangement is when a character arranges another character to perform their own Mercy Kill. As a Death Trope, several if not all spoilers will be unmarked. You have been warned. Baseball and softball: From youth leagues through semi-professional, a common rule is for the winning team to have a 10-run league after the end of the fifth inning, although some leagues end games before that (usually, the earliest is the third inning) if the winning team has an even larger lead, such as 15 runs after four innings, with the home team, if they are trailing, having a final at-bat. This is a rare aversion to post-secondary teams having a mercy rule in place, as the college level and many semi-pro leagues often have some sort of mercy rule in these sports (although professional does not have this rule). Basketball and football: Many state high school athletic associations use a "continuous clock" after a score differential is achieved after halftime. In this instance, the clock doesn't stop for things that it would normally be stopped for, such as going out of bounds or moving the down markers in football, or fouling in basketball, although the clock would stop for such things as time outs. States with continuous clock rules still often have the discretion to end a game early, provided that it is halftime or later. Combat sports: technical knock-out, by which the referee can end the fight early if he deems one of the combatants cannot continue without risking permanent damage or worse. The act of throwing the towel and forfeiting a match is based on the same principle, only done by a fighter's cornermen even against his wishes. Soccer: Most youth leagues and a number of state high school athletic associations have rules ending games at halftime or later if a certain goal difference is reached; usually, this is the leading team ahead by 10 goals. In Anathema, technically every murder is this. Either you murder your victims or they, and everyone else, will suffer a slow, horrible, death as the planet becomes uninhabitable. It's a common joke about the legendarily terrible game FATAL that the spell of the same name, which kills absolutely everything in the world, is this. Oh, and it's possible to cast it by accident when you miscast an entirely different spell. Vampire: The Masquerade has Salubri-antitribu with their special Discipline Valeren. One of the abilities of that Discipline is to give instant and painless death to person, actively willing it. The humans of Warhammer40000 refer to mercy kills as "The Emperor's Peace." Space Marine Apothecaries carry a special pistol for just this purpose...and then they chainsaw open the chest of the fallen to get at his genetic material. With the utmost respect, of course; without those "gene-seeds", the many chapters of Space Marines wouldn't be able to replace their losses. The Commissar's (and formerly the Sanctioning Officer's) special rule "It's For Your Own Good" evokes this on psykers when their own hands cannot be trusted. This is the standard Imperial response to any human infected by Genestealers. Since the infection is incurable by normal Imperial medicine, and causes the infectees and their children to be subordinated to the Tyranid Hive Mind, it's considered better for everyone to end it quickly. Exterminatus could be considered this. When a world has been overrun by xenos or chaos forces and is beyond saving, Imperial forces will order the planet's biosphere wiped clean through orbital bombardment, cyclonic torpedoes, virus bombs or other methods of destruction, sparing the inhabitants of the planet from further suffering. Older Than Feudalism: Though it tends to get lost due to Values Dissonance, this is one reason Euripides' Medea opts for Offing the Offspring when Jason marries someone else, since as a foreign-born woman her children would lose their Greek citizenship and inheritance once Jason remarried, and were very likely to be sold into slavery. In one of the routes in Tsukihime, Akiha is succumbing to her demon blood and begs Shiki to kill her if she loses control. 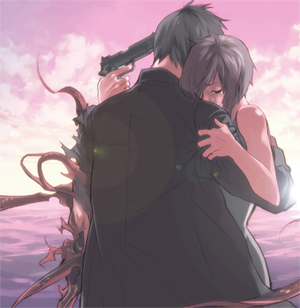 When she does, if you don't keep your promise and keep her alive, you get a depressing "Normal Ending" where she's basically become a mindless, bloodsucking doll under Shiki's care for the rest of her "life". If you do kill her, you get a Bad End. No, to get a decent ending you have to Take a Third Option. Also, Shiki killing Satsuki after she became a murderous vampire, earlier on. In Heaven's Feel route, Shirou is forced to do this to Saber after she is hit by The Corruption and turned into Saber Alter. Especially bad, as Saber had been a symbol of purity throughout the game, and had been your primary love interest in the first route, as well as a possible love interest in the second route. In one bad ending Shirou is reduced to a torso and head suspended in a liquid that has left him drugged into insensibility. When Rin finds him she shatters the container, letting Shirou die. New Danganronpa V 3: Gonta is tricked into killing Miu when Kokichi tells him that, if everyone guessed wrong, it would end out in a mercy kill with the students (Kokichi included, but Gonta and the mastermind excluded) on the receiving end.